Arrival at the International Airport "José Martí" in Havana. Transfer directly from the airport in classic American cars and enjoy a ride through the city. Arrival at the selected hotel, Riviera. Riviera de La Habana is a current National Monument that was once the best luxury hotel in the country. 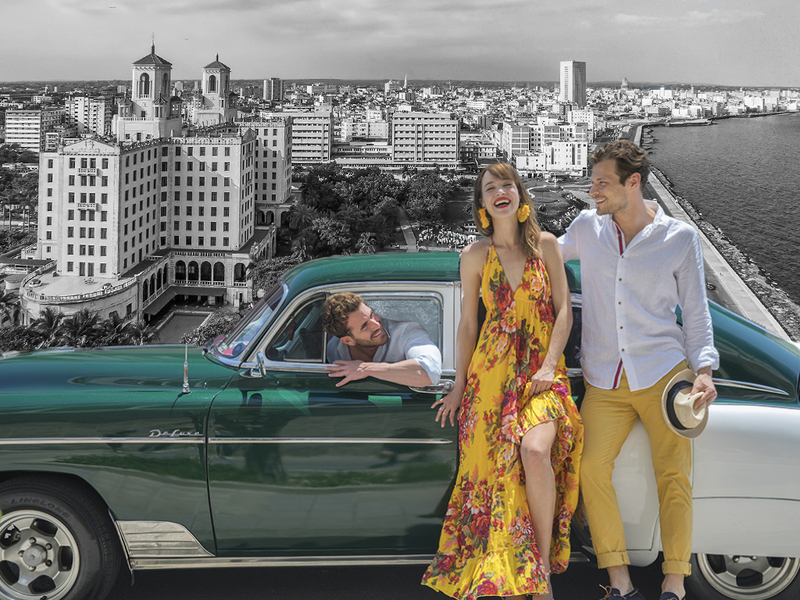 Its extraordinary location near the malecon of the capital makes it one of the favorites especially because it keeps the classic style of the 50s. At the turn of 1950s of the last century, the American mafia man Meyer Lansky established his command in Havana, after a series of alliances in Las Vegas and creates the company Riviera de Cuba S.A. In addition, the hotel was named Riviera in memory of the famous French Riviera. When we arrive at the hotel we travel in time doing a tour that we call Riviera tour, in this tour we will hear anecdotes and unique legends related to the mafia´s man walk through those grounds, we will spend time in the former casino, acoustically designed so that the sound of the chips and slot machines would be heard throughout the hotel and so lure guests into the game. Visits will include a stop by the bar called El Elegante where a cocktail awaits you and also the restaurant L'Aiglon where you can have lunch before retiring to your rooms. Time to relax at the Vista al Golfo bar where the client will be amazed by the celebrities that have visited its Hall of the Fame located next door. Departure to a guided tour of the modern part of the city including 23rd Street, Línea Street, the University of Havana area where brave young people faced the island's then government. Return to the hotel to enjoy its kindness. Lunch at Al Fresco Restaurant , facing the best view of the coastal area. Free afternoon and transfer to dinner and show at Cabaret Tropicana. Since its inauguration in 1939 the Cabaret has not stopped working, reaffirming and renewing itself constantly based on Cuban culture. It has become an identity product of the country and show the sensuality of the Cuban. Its most significant emblems are two sculptures, made by renowned artists: "Bailarina" (Rita Longa, 1950) and "The Fountain of the Muses" (Aldo Gamba, 1952) The shows have taken elements of dance (classical and folk), of music, circus art and plastic arts to create an own and subjugating style. Transfer to Havana airport or continue a program in another tourist area in Cuba.